A theme that threads through many of our longer term posts is that the model of capital accumulation associated with Reagan and Thatcher is over (see here, here and there) . What is to replace it is not clear--anymore than when Nixon made the final break from the gold standard and introduced wage and price controls 42 years ago today, we knew Reagan and Thatcher was less than a decade way. Our argument is that we are on the cusp of significant social change. Because our understanding of social change is evolutionary, parts of what is to emerge is here now. This Great Graphic was posted on ARS Technica. 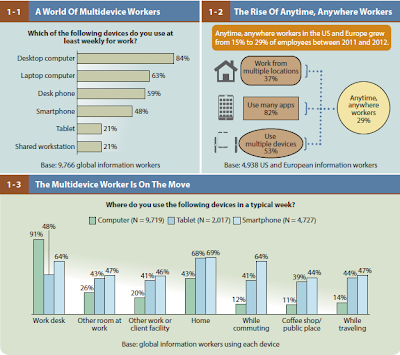 The charts draw from Forrester survey data. They point to what some of those changes may entail. First, the importance of computers and technology may increase the stratification of society in that computer literacy will only increase in importance. Education and access is important. Second, increased mobility will be a feature. Third, the separation of what is personal and public, and what is work and leisure time will be blurred. The relationship between employers and employees will be transformed. Some observers, like the Financial Times, which carried on editorial one the subject earlier this week, tend to emphasize the rise of what it calls the "shared economy", which is about the enhanced collaborative process. Although it is clear to shy away from claims that it represents an alternative to capitalism, it waxes on about a shift from "the pursuit of self-interest to a passion for sharing", which I suppose this blog could be cited as evidence. I am less convinced this is the case and suggest the "sharing economy" is not new, though the internet facilities and enhances it. I would locate it in the not-for-profit sector of the economy, which is larger than the for-profit sector. It includes most schools, hospitals, libraries, places of worship, the government, charities, volunteer activities, etc. The rise of the anytime, anywhere worker is predicated on technological advances in computing, networking and mobility. Forrester's survey of nearly 5000 information workers in Europe and the US found that this cohort almost doubled its share from 15% to 29% of that segment of the work force from 2011 to 2012. The operative forces are not limited to information workers and seems more generalizable, even if to varying extents. There are numerous implications for life styles (the so-called life/work balance), organization of work and supervision, and one's relationship to one's employer.